So, last week’s Fespa show has closed and we’ve all survived blisters, after show parties and a general lack of decent coffee. Here’s a second story on the show, now that I’ve been home for a few days, with a catch up to some of the things that I saw in the last couple of days. But I’ll deal with some of the more important themes in subsequent posts. 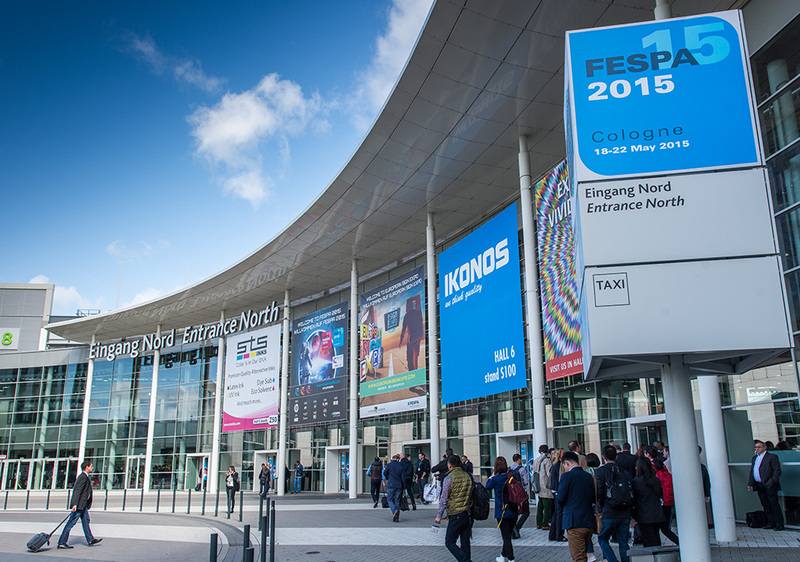 The North entrance to Koln Messe for the Fespa 2015 show. Everybody I met at the show asked me if I’d seen anything new with nobody admitting to having found anything exciting. I don’t think there’s really been one headline-grabbing announcement or genuinely new technology demonstration though I started off with a long list of new things to look at and didn’t have time to see all of those. But this lack of hard news is partly due to most vendors having already pre-announced their Fespa line-up over the last couple of months. It is, of course, completely right to focus on giving visitors a good reason to spend their time and money at the show, rather than feeding the cravings of itinerant journalists for news. But it’s also true that for this show we have mainly seen small iterations of existing printers, with slight improvements to speed, image quality or both. 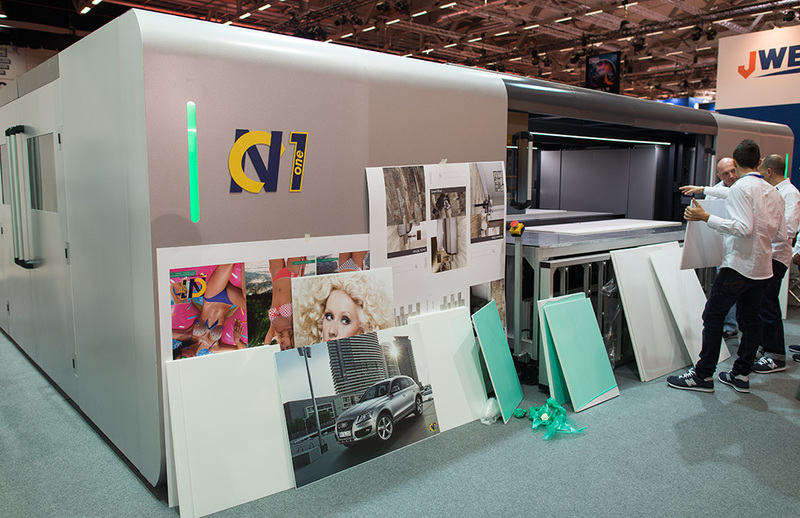 Probably the most interesting machine at the show was the Durst WT250, which uses a water-based UV ink. It’s a big printer as the water has to first be dried off the print before the UV is cured. More on this to come in a later post. But one of the target markets for the WT250 is the corrugated packaging market. This in itself is becoming quite a theme, with several vendors also targeting the corrugated market. Thus HP announced a new Scitex 17000 flatbed to target this market, even though it’s barely a month since HP launched the Scitex 15500 corrugated printer. It’s got the same corrugated grip and HDR230 inks as the 15500. But whereas the 15500 is a six-colour printer, the 17000 uses two sets of CMYK allowing it to be nearly twice as fast. HP also showed off another variation of its large flatbed, the HP 11000, which was announced earlier this year and now includes varnishing. Neocha showed this LED UV printer complete with its own housing. NeoCha showed off its UV printer. To say this is a big printer would be an understatement – I’ve lived in smaller houses. The NeoCha 1 is a flatbed UV printer with LED curing. 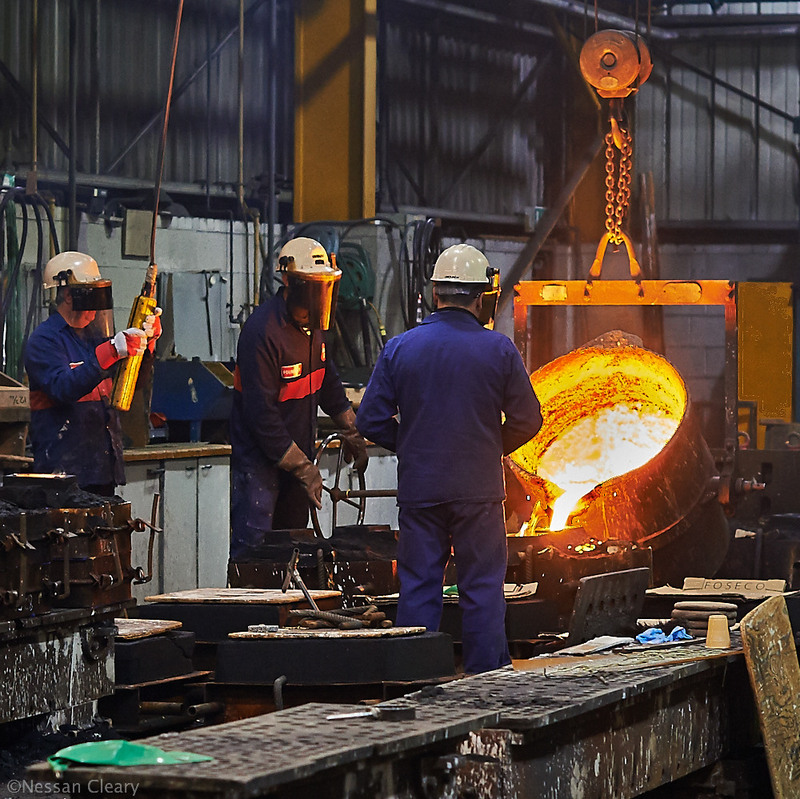 It takes boards up to 3.2×2 metres and can produce up to 700 sqm/hr or around 320 boards. Marketing manager Stephanie Duvivier says that the enclosure is to protect the heads and keep the machine running at its optimum. It uses 30khz Kyocera printheads with a native resolution of 600 x 600 dpi. The drop sizes range from 3 to 14 picolitres. It’s a four colour CMYK machine – Duvivier says: “We don’t need light colours with this resolution.” That said, there are four additional slots for white and spot colours. It can be configured with up to five heads per colour. NeoCha itself was set up in 2010 by Marco Baio, formerly head of Nur Europe, so no surprise to find that many of the staff, including Duvivier are also ex-Nur. Screen W3200 UV wide format printer with roll to roll option fitted. Screen showed off the new rollfeeder for its W3200UV. It’s a sensible addition as it means you can leave the printer running overnight, though Martijn van den Broek, Screen’s European product manager, points out that the printer can get through a full roll in under two hours. The roll-feeder can handle rolls from 0.75m up to 3.2m wide and can keep up with the printer’s maximum speed of 150 sqm/hr. It attaches to the front and back of the W3200, with the media stretched across the bed. However, it is worth noting that it wastes nearly three metres of media to web up the feeder and that you can’t print to the media otherwise as it needs the tension. There are locking pins that hold the bed in position and once these are engaged the front end automatically switches to roll mode. It’s an easy retrofit, taking less than a day to install in the field. Fespa also hosted a small section on 3D printing, which didn’t really have anything new to say about 3D printing. Still it was better than the industrial printing section, which was an empty and unmanned space with a couple of examples of industrial print with no further information. Then again, there were plenty of samples of industrial printing spread liberally around the various stands throughout the show. 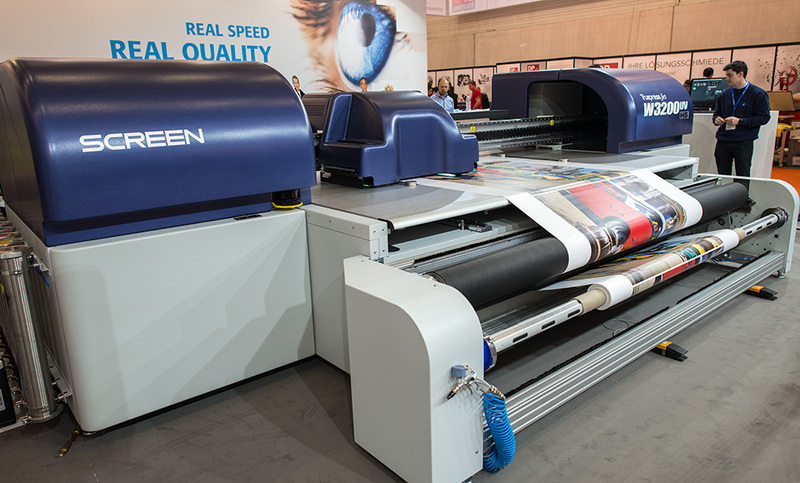 That perhaps was the most important message from the show – that wide format is a mature technology that is becoming widely used in many different applications and industries.